We believe the design process is a personal one, and no one project is alike. From beginning to end, we ensure that all ideas and concerns are fully embraced, bringing each clients’ vision to life. Every project is a collaboration of our team’s unlimited ideas and solutions, and more importantly the client’s goals. At the beginning of the creative process, our technical team carefully reviews the architectural plans to assess the efficiency of the space from the inside out. We work with architects, builders and clients, landscape architects, and the entire team to streamline production and implementation of plans. Both our design team and clients bring their unique skillsets and backgrounds together to establish lasting functionality and livability in each design. 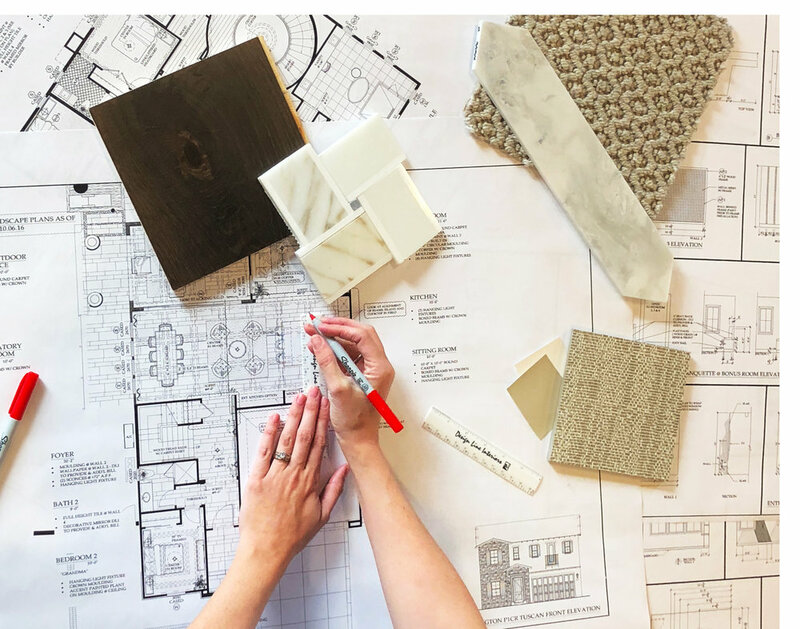 Our process of layering interior finishes is custom-tailored to each project down to the finest detail, elevating the extraordinary from the ordinary. The combination and application of materials in each environment not only defines the style of the project, but can accentuate architecture to enhance visual perception of space, create a sense of intimacy, and encourage flow and cohesion throughout. Once floorplans are determined and materials are selected, we begin the process of selecting furniture. Integrating interior furnishings with materials and space constraints is essential to what we do. Meticulous scaling of each piece and careful placement is crucial to the sensory impact of each room. The curation of different colors, patterns, and textures is where the character of the design really begins to translate. We believe it’s the little details that are vital to make big things happen. Our staff of skilled idea-makers and treasure hunters thrive on imagination, shaping the interior experience through the manipulation of spatial volume as well as surface treatment. We consider many components when selecting art and accessories to create lasting impressions. We gravitate to items that are unusual, organic, artistic and add rhythm. We strive for spaces that communicate personality, stimulate inspiration, and create a visual crescendo. Installation is where the team's creativity, planning, and hard work comes to fruition. Carefully selected furniture arrives, art and accessories are placed, and the dream finally becomes reality. Continuing to perfect our designs is our specialty, and listening to questions, comments, and concerns are crucial to creating exceptional experiences for each client. After a project is installed, our service does not end. Our goal is to maintain the quality of the interiors with continued contact with our clients and projects, assuring that the interiors look as impactful and inspiring as they did day one.